Disneys Hollywood Studios opened as Disney-MGM Studios in May 1989. The detailed façades of Hollywood Boulevard and Echo Lake in Part 1 and Part 2 of this series were part of the park on opening day. In July 1994, Sunset Boulevard opened as a major expansion of the park. The Imagineers lavished the same care on the façades of Sunset Boulevard—and thats what this page is about. Legends of Hollywood looks like a movie theater, but its actually a shop. Another theater-as-a-shop, the Beverly Sunset Theater, is across from Legends of Hollywood. 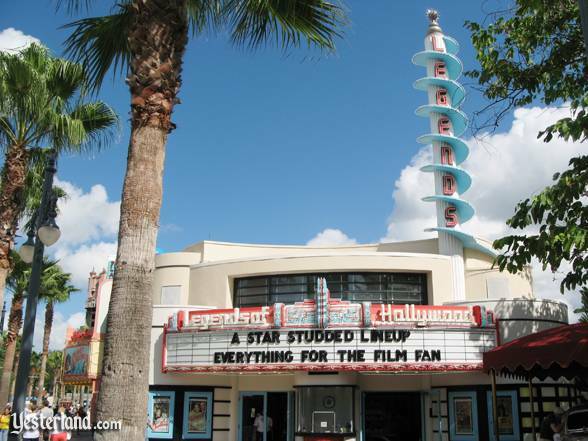 Together, the two theaters form a fitting “Movietown” entrance to Disneys Sunset Boulevard. The Beverly Sunset Theater is based on a real movie theater that was demolished in 1988, the Warner Beverly Hills Theater at 9404 Wilshire Boulevard in Beverly Hills. In California, the former Academy Theater is now the Academy Cathedral. Unlike Legends of Hollywood, theres no distinctive spiral fin on the 125-foot tower sign. However, if you look at historic photos of the Academy Theater, it once had such a spiral fin too. 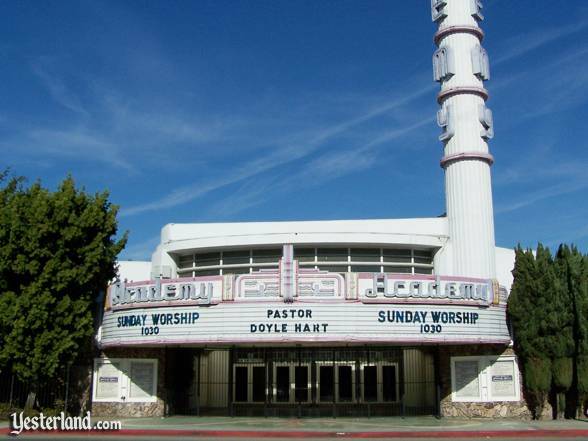 This terrific Streamline Moderne style cinema by famed theater architect S. Charles Lee showed movies from 1933 until 1975, when it became a church. It was named the Academy Theater because it was supposed to become home of the annual Academy Awards presentations, but that never happened. Villains in Vogue is one store with three façades. The left façade is the Beverly Sunset Theater. The center façade has the Villains in Vogue sign. Inside, a striking sculpture of the Siamese cats from Lady and the Tramp sits atop a merchandise fixture. Its the centerpiece of a store that sells merchandise based on Disney villains and the Pirates of the Caribbean movie series, as well as candy. Today, the Pasadena building is a sad-looking Public Storage facility. But when it opened in 1940, it was the Pasadena Winter Garden, a spectacular Streamline Moderne style ice-skating rink. It was designed by Pasadena architect Cyril Bennett. Olympic champion Peggy Fleming developed her skills at the Pasadena Winter Garden. At the end of 1966, the ice rink closed. The building took on a new role as a U. S. Postal Service sorting facility. Theres a story that the ground deep below the building was permanently frozen after more than a quarter century under the freezing coils of the ice surface. This meant that the postal employees had to work of a freezing cold floor. Eventually, the Postal Service moved out. After sitting vacant for a decade, it became a storage facility. The right façade of doesnt have a sign, except for the second-story window signs. The door leads into the Villains in Vogue store. 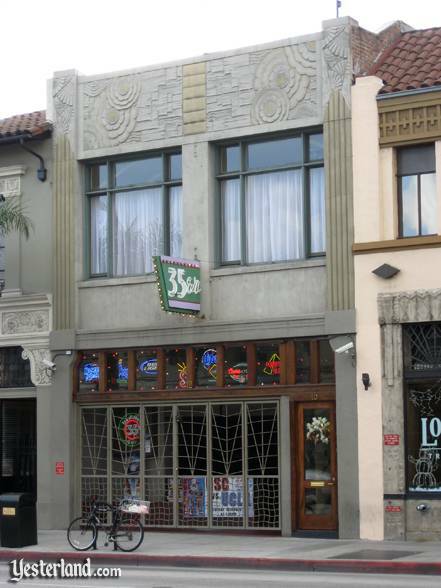 The 35er is a bar in Pasadenas Old Town neighborhood. In business since 1962, the family-owned and operated 35er enjoys the title of the oldest cocktail lounge in Pasadena. The buildings history before 1962 is more of a mystery. The Designated Historic Properties List of the City of Pasadena includes the 35er, but only identifies the year it was built as circa 1950 (it looks older to me) and does not identify the architect. At first, the unusual architectural ornamentation at the top of the building appears to be faithfully reproduced at the Studios park, except for the more striking colors of the Disney version. Closer examination reveals various differences, especially that the right panel is a mirror image of the left panel in Disney version, while the right panel of the 35er is the same as the left panel, but rotated 180 degrees. Mouse About Town sells character t-shirts and fancier character apparel, such as brightly colored Mickey Mouse golf shirts. 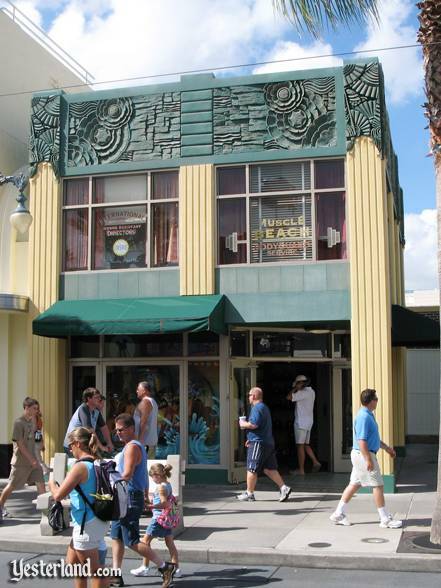 Have you noticed that Disneys Sunset Boulevard façades arent from the real Sunset Boulevard? In fact, most are from nowhere near the real Sunset Boulevard, which doesnt pass through Inglewood or Pasadena—or through Oakland and San Francisco, which are both represented in Florida (but not in this article). The Berman Building is an exception. Its right on Sunset Boulevard. 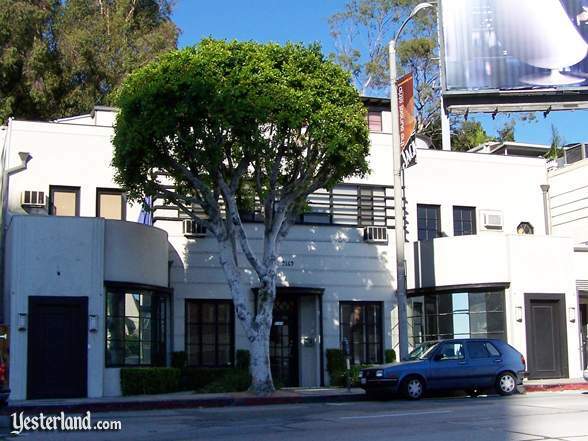 In its early years, this Streamline Moderne style building from the 1930s housed Berman Furs and several talent agencies. How about a slice of pizza or an Italian deli sandwich at Catalina Eddies? What could be more American than a cheeseburger from Rosies All American Cafe? If you want something healthier, get some whole fruit or carrots and celery at Anaheim Produce. And theres more than just food—you can also learn about Disney Vacation Club. The Sunset Ranch Market has outdoor tables, covered for shade. Its a quiet place—except for the periodic screams from the nearby Twilight Zone Tower of Terror. The Los Angeles Farmers Market began informally in July 1934 when farmers were invited to park their pickup trucks on an empty field and sell fresh produce from their tailgates. Soon, wooden stalls replaced the trucks. An expansion in 1941 added a series of simple buildings and a landmark clock tower. Over the years, the Los Angeles Farmers Market has become an indoor/outdoor maze of stalls, stores, grocery vendors, and eateries that attracts three million visitors each year. Some visitors are locals who shop for meat, fish, poultry, fruits, vegetables, candy and nuts from small markets. Others are tourists who explore this famous Los Angeles attraction, shop for souvenirs, and have lunch at the outdoor tables. The Carthay Circle Theater at the Studios park is another theater-as-a-shop. 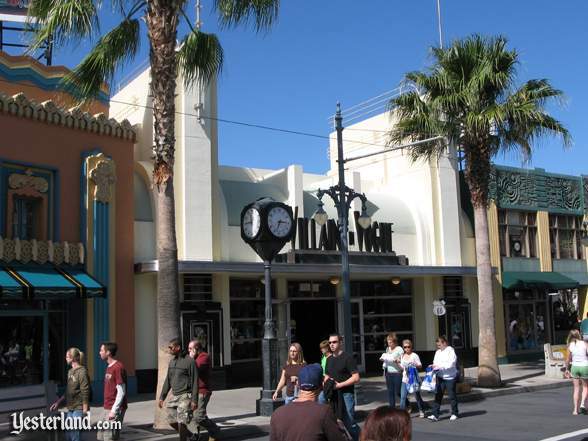 Its at the end of the Sunset Boulevard shopping street, facing the Twilight Zone Tower of Terror. Its one of the more interesting shops, with Disney-themed kitchen and serving items. Sorry. I cant show you a current photo of the Carthay Circle Theater. The historic movie theater at 6316 San Vicente Boulevard in Los Angeles was demolished in 1969 to make way for a nondescript office complex. 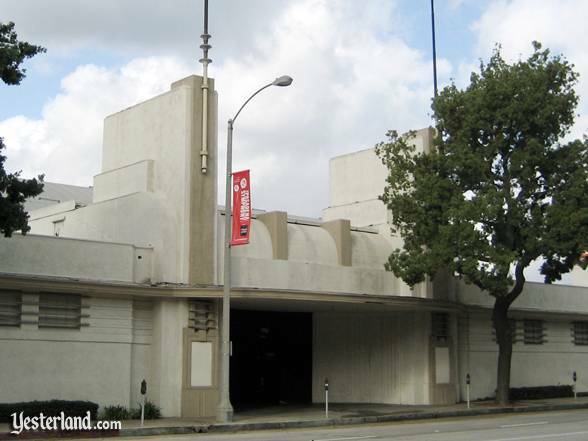 The impressive Mission Revival style theater, designed by architect Dwight Gibbs, opened in 1926. For more than forty years, the ornate 1500-seat auditorium was one of the top theaters in the Los Angeles area for exclusive engagements of major movies. The Carthay Circle Theater hosted numerous Hollywood premieres, including Walt Disneys Snow White and the Seven Dwarfs (1937) and Fantasia (1940). Back in 1929, when distributor Pat Powers claimed that theater operators would not want Walt Disneys first Silly Symphony, Skeleton Dance, Walt personally arranged to have it shown at the Carthay Circle Theater. It was a hit with critics and audiences at the prestigious theater, paving the way for national distribution. By now, every Disney fan knows that a new replica of the Carthay Circle Theater will be the “castle” for Disney California Adventure, as part of the once-troubled parks billion-plus dollar makeover. It wont be the scaled-down version from Florida. The reports are that the majestic theater building will house a dining room, cocktail lounge, and membership club. What a great idea! I cant imagine a better choice as the new icon for the park. The historic connection to Walt Disney is strong. The Carthay Circle Theater is a Los Angeles landmark, but not one thats a half hour away from the Disneyland Resort. The buildings architectural style will go well with the new Mission Deco style entrance plaza. And the theaters distinctive silhouette would even make a great logo for the revamped park—one that would nicely complement the Disneyland castle logo. If you want to see more, continue to Part 4. Theres also Seeing Triple: The Darkroom and the Derby, about how three parks were inspired by a store that looks like a camera and by two legendary restaurants. Throughout Yesterland, I credit photographers in fine print at the bottom of each page. I appreciate the terrific pictures that Ive received over the years. I thank them privately, but in the case of this series, I need to thank Chris Bales and Charles Wang publicly. Each of them drove all over Los Angeles County to take many of the Los Angeles area pictures in this 3-part article, the 2-part Disneys California Adventure article, and the “The Darkroom and the Derby” article. Chris and Charles, Thank you! Photo of Legends of Hollywood on Disneys Sunset Blvd. : 2007 by Werner Weiss. Photo of Academy Theater in Inglewood: 2007 by Chris Bales. Photo of Villains in Vogue (middle façade) on Disneys Sunset Blvd. : 2008 by Werner Weiss. 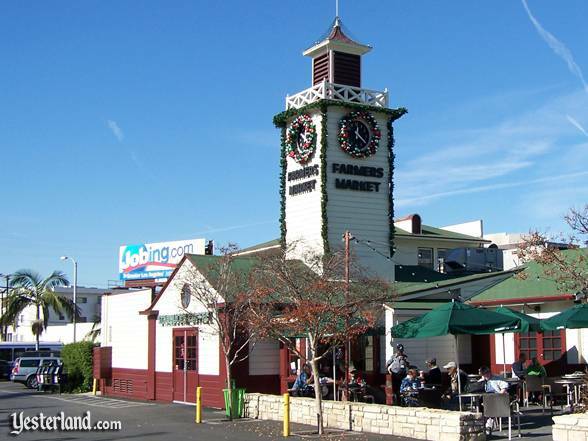 Photo of former Pasadena Winter Garden in Pasadena: 2007 by Charles Wang. Photo of Villains in Vogue (right façade) on Disneys Sunset Blvd. : 2007 by Werner Weiss. Photo of 12 East Colorado Blvd. in Pasadena: 2007 by Charles Wang. 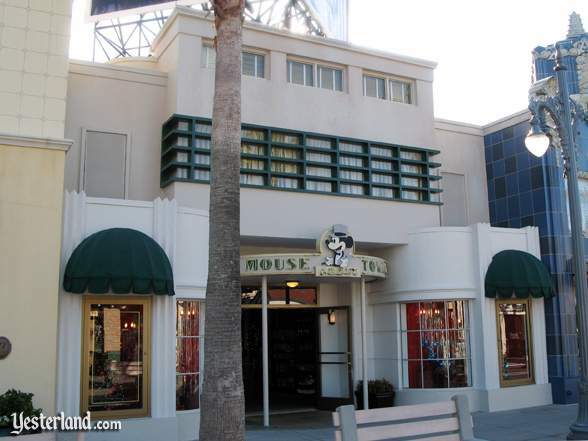 Photo of Mouse About Town on Disneys Sunset Blvd: 2008 by Werner Weiss. Photo of 9169 W. Sunset Blvd. in West Hollywood: 2007 by Chris Bales. 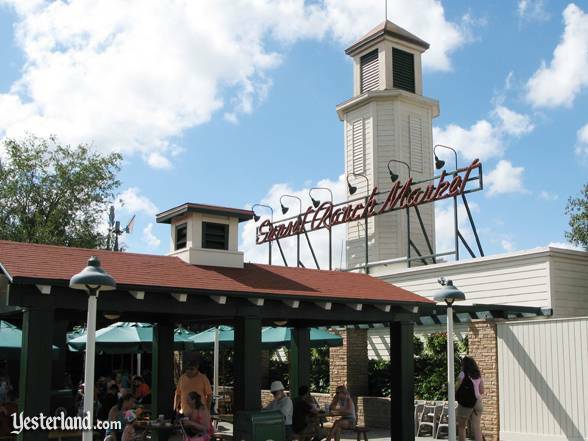 Photo of Sunset Ranch Market on Disneys Sunset Blvd. : 2007 by Werner Weiss. Photo of Los Angeles Farmers Market: 2007 by Chris Bales. 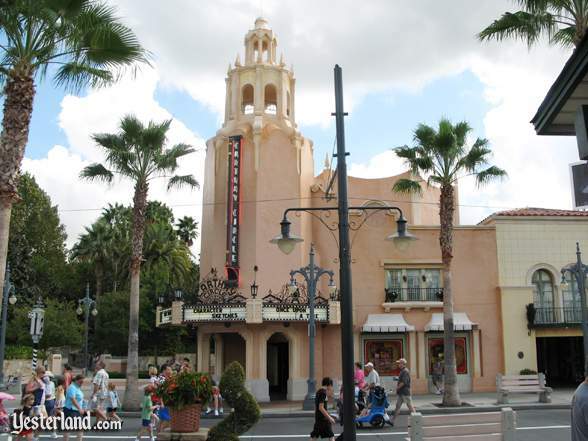 Photo of Carthay Circle Theater on Disneys Sunset Blvd. : 2007 by Werner Weiss. 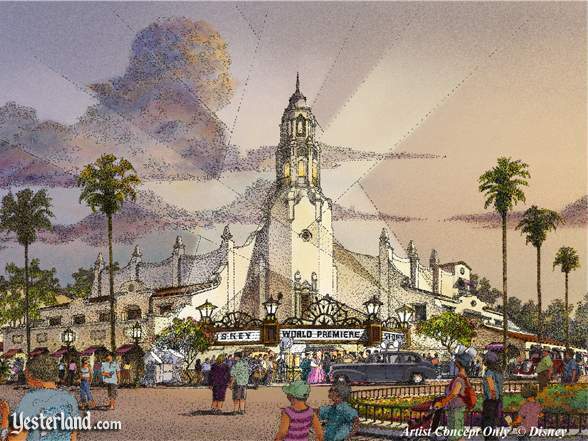 Artist rendering of Carthay Circle Theater (Disneys California Adventure press release): © Disney.